This adapter lets you to connect either one or two Pedal I/O modules to a 1st generation audio jacks board in a 7U performance case. It is not needed if your case contains a 2nd generation audio jacks board. 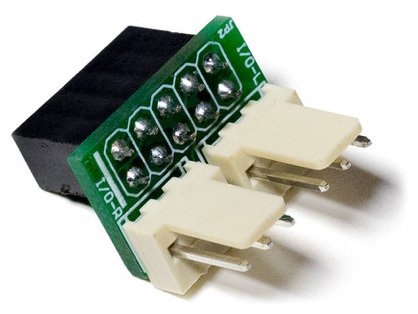 This adapter allows you to connect up to two Pedal I/O 1U interfaces to the 1st generation Audio Jacks Board built-in to our 7U performance cases (should you not already be using those jacks for standard audio I/O duties). It eliminates the need for the Pedal I/O JACKS 1U module. NOTE: This adapter is not needed with 2nd generation Audio Jacks Boards, which began shipping inside 7U cases in early 2019.